Oregon Skywalker created this beautiful drone video shot on the Columbia River, unquestionably the most important in western North America. It drains a huge section of the mountains of the USA's Pacific Northwest and Canada's British Columbia province, running 2k km (1.24k mi.) before discharging into the Pacific Ocean in Oregon. The third largest purely USA river by discharge volume, it supplies the region with some of its top tourist spots as well as most of its electricity. 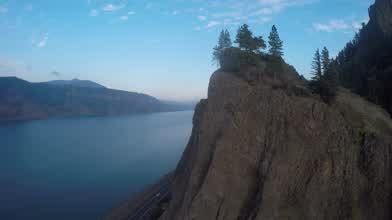 Description: Beautiful flight in the Columbia River Gorge. Enjoy the wonderful view, thank you for watching.